Back in 2006, a 15 year old girl posted this to YouTube. I have been posting it on Memorial Day ever since. An independent horror film shot last fall in Apache Junctionwill make its world premiere Friday, May 24 in Tempe. “Speak No Evil” will be shown at 10:30 p.m. Friday at Harkins Valley Art Theater, 509 S. Mill Ave. Its stars, Gabrielle Stone and Carl Jensen IV, will attend. A second showing is scheduled for 10:30 p.m. Saturday, May 25; it will include a question-and-answer session with the film’s director, Roze, and Ms. Stone immediately after the show. In addition, fans can view “Speak No Evil” at the Phoenix Comicon pop culture event during a free screening scheduled for 2:30 p.m. Sunday, May 26 at the Phoenix Convention Center, 100 N. Third St. in downtown Phoenix. The cast and producing crew will be on hand to discuss the movie-making process with Comicon attendees. Editors comment: So much for our elected officials having integrity and intelligence. Remember these people at voting time. The Arizona Senate on Thursday approved expanding the state’s Medicaid program, capping a rancorous debate that had split the Republican Party and had been building since January, when Gov. Jan Brewer issued a surprise call to increase Arizona’s health-care program for the poor. A handful of Senate Republicans teamed with Democrats to approve the fiscal 2014 budget plan and overcome a flood of amendments intended to scuttle Medicaid expansion, pushing through the governor’s top legislative priority on a 19-11 vote after three hours of debate. Although the legislation faces an uncertain future in the House, its passage late Thursday was a key victory in the governor’s effort to bring health care to an additional 350,000 Arizonans. Brewer and her supporters — including some who, like her, oppose the federal health-care overhaul that makes expansion possible — said Arizona could not afford to reject the billions of federal dollars that come with it. Seven area residents were honored this week by the Mesa Fire and Medical Department for running toward danger rather than from it. Stephen Stacy, an 18-year-old from Gilbert, was driving March 27 on U.S. Highway 60 when he observed a vehicle in a rollover accident at Tomahawk Road. Mr. Stacy, an Apache Junction Fire Explorer and Tribal Nations Wildland Response Team firefighter, stopped and called 911; Mesa fire officials, who have a mutual-aid agreement with the Apache Junction Fire District, responded. “He provided first-responder-level care to those involved in the accident. We’d like to recognize him for his efforts,” Bill Hayes, deputy chief of the Mesa Fire and Medical Department, said May 7 before presenting Mr. Stacy with a certificate of appreciation at a Good Samaritans in Action ceremony. It was held in the fire truck bays at Fire Station No. 301, 360 E. First St. in Mesa. 1) The Medicaid expansion will cost much more than projected. 2) The expansion may do nothing to help low-income Arizonans — and could hurt them. 3) The so-called “hidden health tax” won’t get fixed. 4) Arizona must bargain hard to get a better deal. 5) The disgusting ploy to gut Prop 108 taxpayer protections will lead to more tax hikes. The Superstitions 9.12 Tea Party Patriots (http://superstition912teapartypatriots.ning.com/) held their weekly meeting on Thursday, May 09, 2013 at the Village Inn in Apache Junction. The meeting was led by founder Judy Novalsky and opened as always with Prayer and the Pledge of Allegiance followed by a thank you to attending veterans. Judy then announced upcoming events of interest (see the website for information) and advised everyone that Central Arizona College District (CAC – http://www.centralaz.edu/) is looking for yet another rate increase and that everyone should check it out and respond as appropriate. The first speaker was Franky Gonzalez, college student and Arizona State Chairman for Young Americans for Liberty (http://www.yaliberty.org/). Mr. Gonzalez spoke about the Arizona Campaign Bootcamp being sponsored by the Leadership Institute (http://www.leadershipinstitute.org/training/School.cfm?SchoolID=23135) in the Phoenix area (location yet TBA) on June 1. This camp will be led by Chris Doss, Campaigning and Grassroots Organizing Expert. The goal of the workshop is to equip its members with tools to make their campaign work more effective and efficient. The cost is $25 per person. This is an excellent opportunity for politically active conservatives to learn basic nuts and bolts techniques to support successful political campaigns. Mr. Gonzalez advised he would provide more information and details next week. There was also interesting general discussion with Mr. Gonzalez and his friends about their experiences as conservative students at Arizona State University and political issues in the Arizona colleges in general. They also suggested that the group take a look at the DREAMzone project at ASU (http://sts.asu.edu/DREAMzone) for insight on the University perspective. • the media bias to condemn all gun owners and members of conservative groups for the acts of a single individual or group but condemning profiling any other group for the actions of a relative few. This led to discussion on the efforts of the Executive Office and the main stream media to make Benghazi ‘yesterday’s news’ despite public demand for resolution. Mr. Serdy mentioned the interesting fact that the same Congressional Committee that is holding the Fast & Furious investigation is also doing the Benghazi hearings. • The ammunition buy up by the Department of Homeland Security along with multiple other federal agencies, the vulnerability of the right to bear arms to a shortage of ammunition and the possibility of Executive Orders being used to restrict the international flow of ammunition, arms and weapons parts into the country. • The results of the Phoenix Gun Buyback program (funded by an anonymous $100,000 donation) and the state law forbidding the automatic destruction of the weapons collected in such programs. • The Boston Bombing tragedy and the issues of citizenship, due process under the law and community emergencies versus individual rights and freedoms. Like freedom of speech, citizenship must be respected even for the worst of us to protect it for all of us. Likewise, due process under the law must be inviolate or we are no longer a nation of rights but subject to the whims and assumptions of the currently powerful. The balance of individual privacy and property rights and needful police action in a community emergency generated debate. • The discussion ended with comments on the politicizing of our educational system and the need for more people to become involved with the school boards to monitor what is being taught in the schools. It was also suggested that review and respond to Arizona Superintendent of Schools, John Huppenthal and his position supporting Common Core program that is being strongly pushed on the states by Federal Government and national education groups despite significant doubts about its effectiveness and purposes. Superstitions 9.12 Tea Party Patriots supports limited federal government with adherence to the Constitution, individual freedom and responsibility, free markets and returning political power to the states and the people. Summer meetings are every Thursday at 6:30 pm at the Village Inn Restaurant in Apache Junction. Everyone is welcome to come, listen and participate. If you would like to know more, please come to the next meeting or visit the website to read about the group and request contact. I received the following email from Jeff Serdy, AJ City Councilman and owner of AJI Sporting Goods. If you can’t receive this on your radio, you can listen on the Internet by going here and then clicking on Listen Live on their webpage. Apache Junction youngsters had the chance to see the Arizona Supreme Court in action live in their own community Tuesday, when the state’s high court held court on campus at Apache Junction High School. 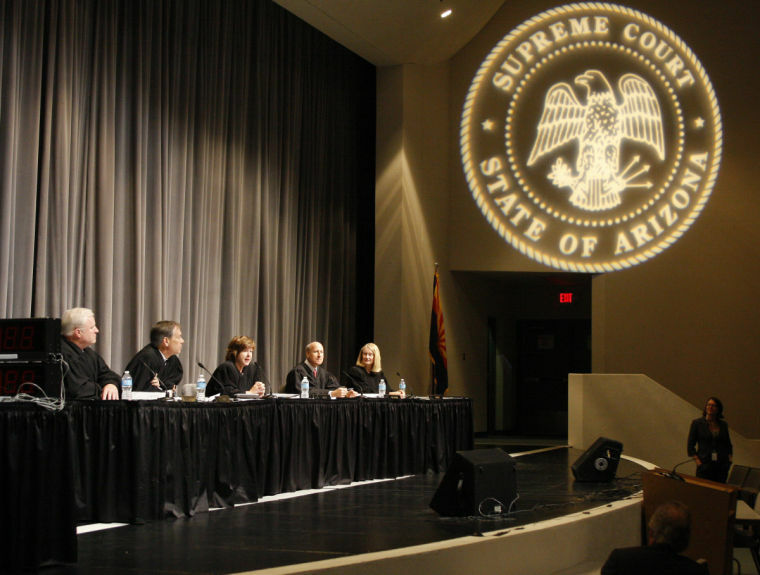 The Arizona Supreme Court, which differs from trial courts in that it reviews laws, rather than serves as a fact-finding court, heard oral arguments from an actual case involving the state and a party representing a pair of individuals. Oral arguments for such cases usually take place in downtown Phoenix, but sometimes are held in other locations for other citizens to experience the process. Apache Junction High School is among the top schools in the state being honored for blood donations by United Blood Services. AJHS earned the division award for highest percent in the Hank Aaron Division for schools in metropolitan Phoenix with 175-349 seniors. Apache Junction residents can help the students continue their good work by donating blood at the next AJHS drive. It is scheduled for 8 a.m.-12:30 p.m. Thursday, May 9 at the high school campus, 2525 S. Ironwood Drive, Marissa Stinnett, student body president, told the Independent during yesterday’s senior interview event.